DAEMON Sync is a tool created by the DAEMON Tools developers, which allows users to backup files from mobile devices to the desktop, over the local wireless network. 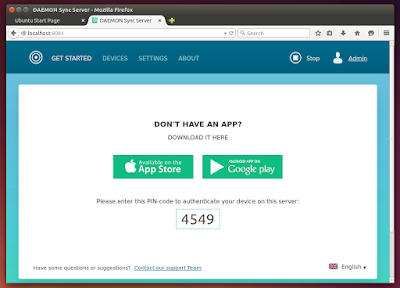 The application is free to use but not free and open source software, and it consists of two parts: the server, which you'll have to install on your computer, available for Linux (only deb files available), Windows and Mac OS X, and the mobile app, which runs on Android and iOS. What makes DAEMON Sync both interesting and useful in various situations is that it requires pretty much no configuration and the data transfer is done on your local network (which is good for security/privacy reasons as well as transfer speed and the fact that you don't need a working Internet connection to use it), without using a third party server. 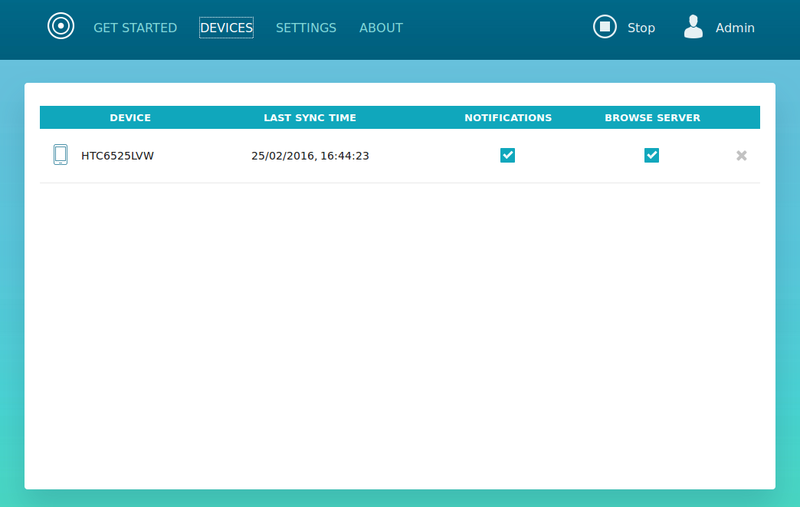 Also, the app allows backing up multiple devices to the same computer and you can browse the files that are backed up to your desktop from any of the devices connected to it via DAEMON Sync (you can choose which devices are allowed to do this). 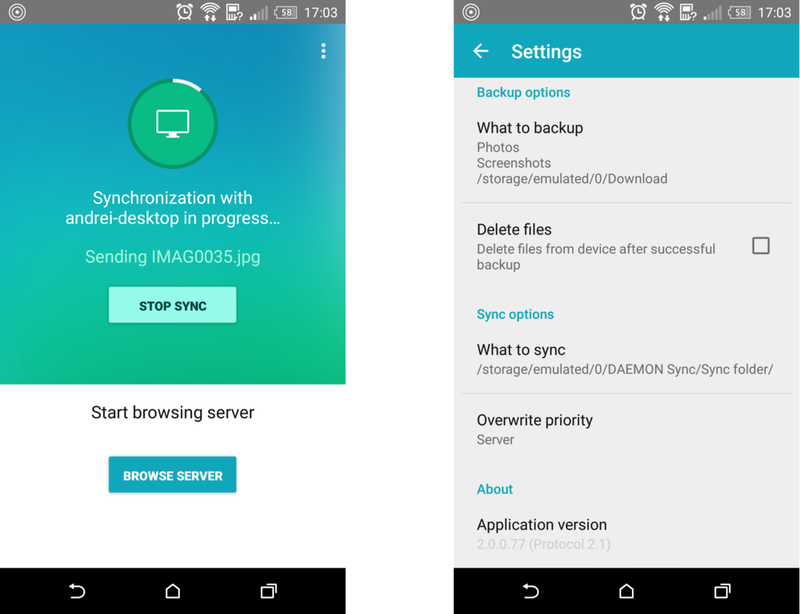 DAEMON Sync is more of a backup than a sync tool. That's because it doesn't watch your files and continuously synchronize them and instead, it comes with a configurable sync interval which, by default, is set to 15 minutes (this can also be done on demand). Furthermore, the only way to add files from your desktop to a mobile device via DAEMON Sync is to place them in a directory named "Sync Folder", which the app creates both on your mobile and desktop and it can't be changed. However, according to the developer comments posted on Google Play, two-way sync is currently under development so it should be available at some point in DAEMON Sync. Think of DAEMON Sync as an easy way to backup your family's phone videos and photos to a single desktop computer, with access to all of them from each mobile device that was paired with the DAEMON Sync Server app, even without an Internet connection (as long as you're connected to the local network, obviously). If you want more flexibility and options, including being able to sync files across multiple desktops, etc., BTSync and Syncthing along with "traditional" solutions like Dropbox are the obvious choices, but for an easy photo/video mobile to desktop backup solution that runs on your local network and doesn't need an Internet connection to work, DAEMON Sync does the job pretty well. To use DAEMON Sync, you'll need to install the iOS / Android app on your mobile device and the server application on your Linux, Mac OS X or Windows computer. Note: the .deb is pretty badly packaged, that's why you won't be able to install it using GDebi - use Ubuntu Software Center, dpkg via the command line, etc. to install it. Also, once you install it, you won't find DAEMON Sync in the menu however, you should find a shortcut on your desktop. 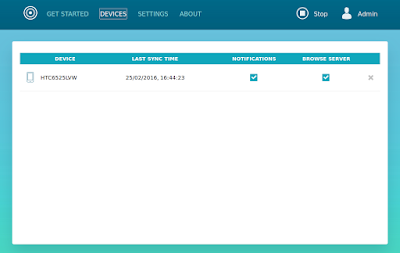 You can also access it directly by typing "localhost:8084" in a web browser. It's also important to mention that on Linux, the default storage folder is "/media/DAEMONSyncStorage/", and inside this folder you'll find "Sync Folder" which allows you to easily sync files back to your mobile device. This folder can only be modified by root, so you should change its permissions (for instance, you can change owner using chown: "sudo chown sudo chown -R $USER "/media/DAEMONSyncStorage". Hopefully this will be fixed in a future DAEMON Sync release.